Mass. State Geologist Steve Mabee and USGS Geologist and EDMAP/STATEMAP program coordinator Doug Howard discuss how geologic mapping addresses pressing societal issues on top of South Sugarloaf in South Deerfield. The view is looking south into rocks of the the Mesozoic Deerfield and Hartford Basins. 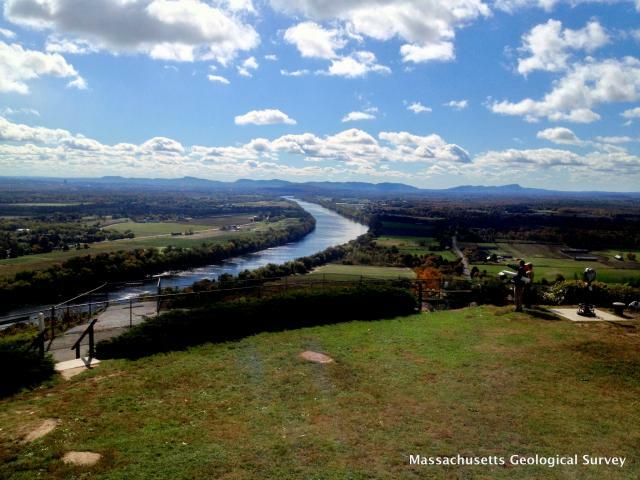 The Connecticut River and Holyoke and Mt. Tom Ranges are in the background.